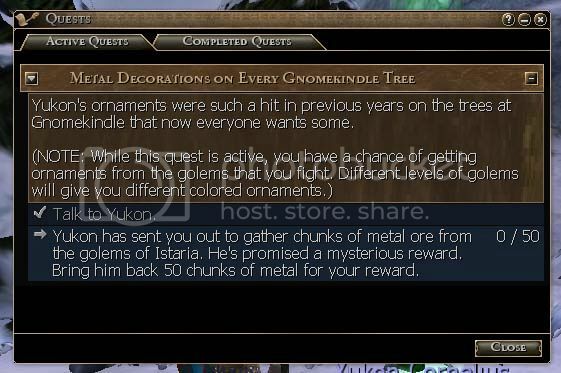 like the title sez, we are gonna meet one last questgiver for this year's gnomekindle. his name is yukon cornelius, and you can find him near the town limit, not far from ignatius the antisocial. 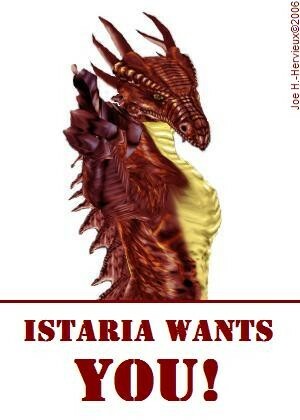 greet him, as you would any other questgiver, listen to the opening story, and choose the 'metal decorations' quest. he will send you out to collect chunks of metal from the metal golems of istaria, so he can make ornaments for gnomekindle trees. 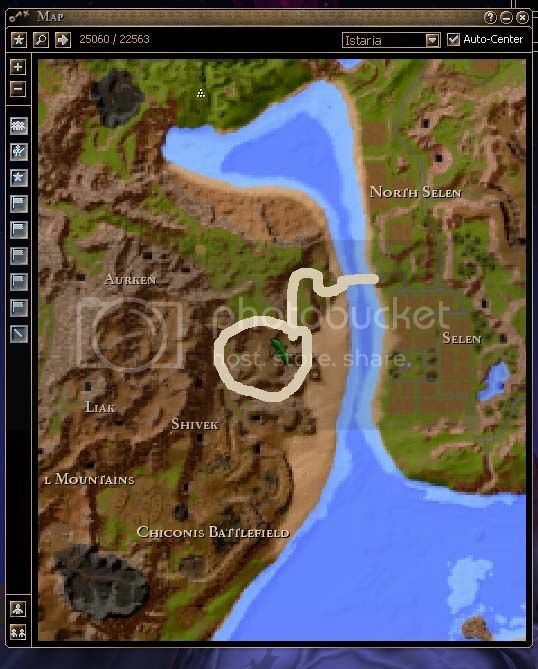 i first tried to hunt nickel gols in aughendell, but quickly found out that they do not count for this quest. 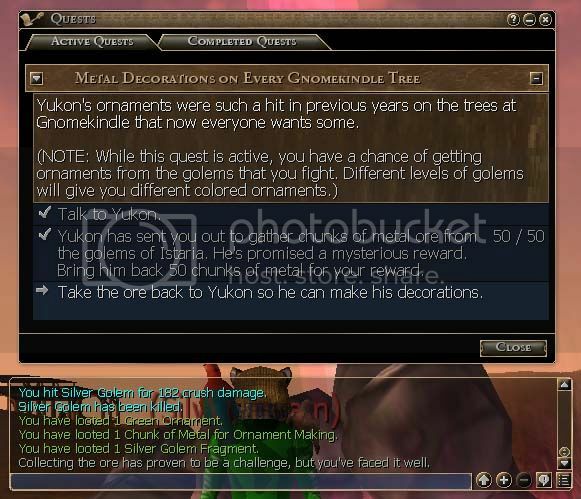 so, remembering that yukon specifically mentions silver and gold gols make the best ornaments, i went after the silver gols in the canyons outside of chiconis. so, port to selen and head west across the bridge. stay on the road until you approach the metal working station. the silver gols are swarming all over the place, including down in the lower canyons. hunt down the required 50 chunks of metal and don't forget to collect the ornaments as well. ornaments are like presents and are used in the same way. 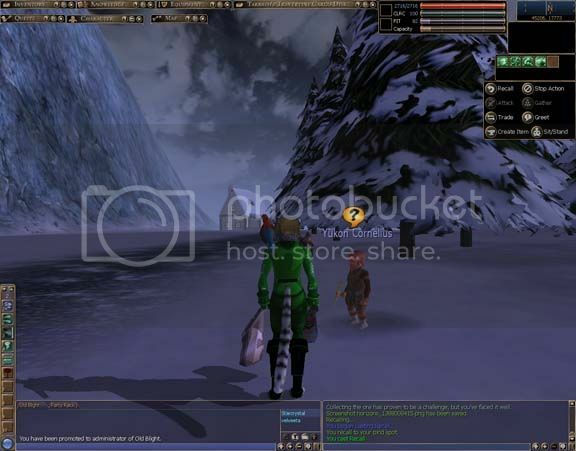 you can check your quest journal, as usual, when you have the needed resources. return to yukon and get your reward of istarian express cheques. use them wisely! 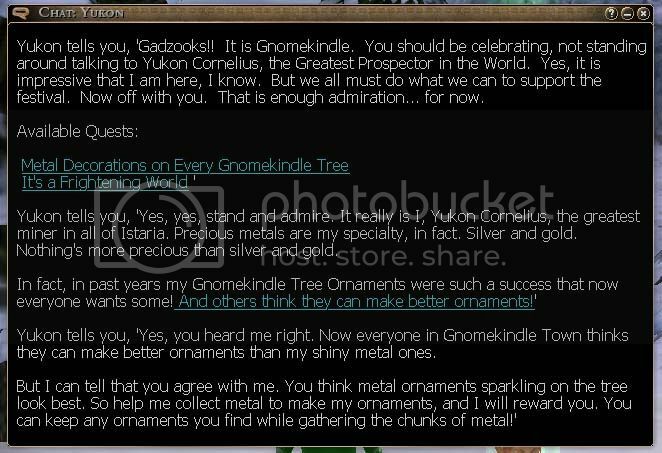 well, that's it for gnomekindle for this year!! come back next time, when we return to the last couple dragon trainers and then it's on to new stuff!! see ya then!